For Minneapolis to NYC transplants Strange Names the last three years have been those characterized by upward momentum and discovery, momentum wrought largely from a record deal with Syd Butler’s (of NYC art punks Les Savy Fav) label Frenchkiss, the success of their debut album –2015’s shimmering pop tour-de-force Use Your Time Wisely –and countless time clocked in front of audiences sharpening the strength of their exuberant live performance. Now, preceding the release of their inspired and thematic forthcoming sophomore LP Data (out February 23rd , 2018 on Frenchkiss), it’s clear that this momentum is only primed to build further. Use Your Time Wisely established the band—made up of Liam Benzvi, Francis Ximénez and Fletcher Aleckson—as creators and performers of buoyant and masterful pop songs, songs that were relatable in the ubiquity of their subject matter but also in their fine-spun reverence to precursory (and magnificently danceable) New Wave greats like B-52s, Talking Heads and The Fixx. Tracks like “Ricochet”, “Neighborhood” and “I Can’t Control Myself” came to wholly define this spirited, endearingly off-kilter energy and helped bolster their profile. On Data these definitive sonic tendencies remain in their purest form, but the soul of the record emerges distinctively amidst a newfound sense of exploration, in both sounds and motif, that bring to light Strange Names’ most daring and realized music to date. 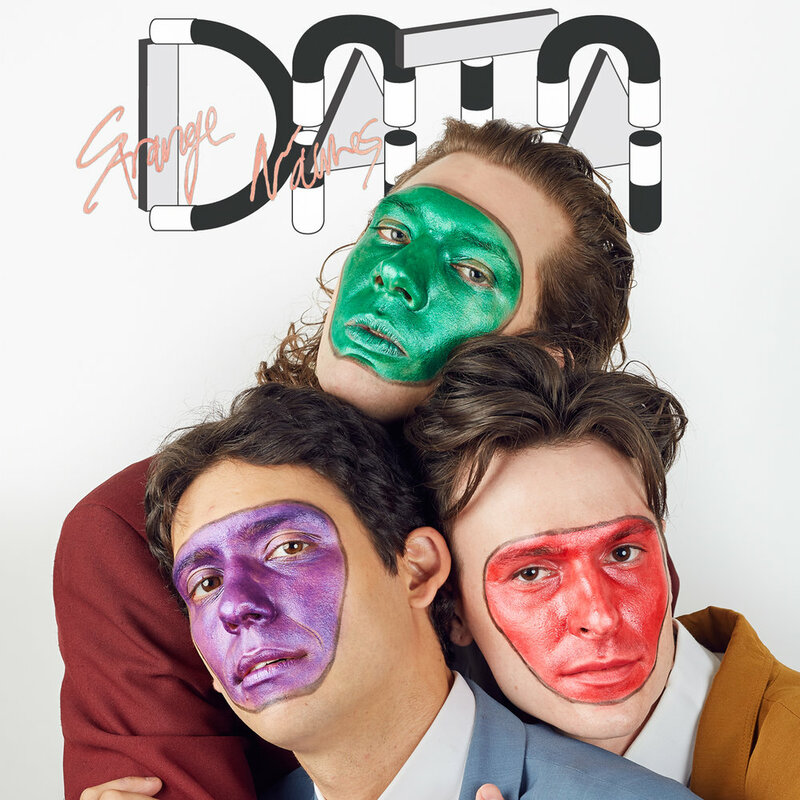 Written and recorded in Brooklyn and self-produced by the band themselves, Data surfaces principally as an album about perspective, boldly conceptualized from the viewpoint of aliens observing human behavior on earth in a methodical, scientific way, quite transparently, collecting “Data”. Where their previous record emanated a more sleek and modular sound, Data ushers in a more rambunctious, rock-centered audio-aesthetic. Leading with bouncy opener “UFO”, they establish a driving framework that carries through the entire album. From the surging syncopation of “People to Go” to the infectious space-funk of “Keep Walking Away” to the melodic verve of “Into Me”, they have completely and brilliantly shifted their sonic references to a territory where allusions to Womack & Womack / Island Records heyday take rightful precedence over the silvery synth structures of derivative ‘80s New Wave. On “People to Go” the band enlists the vocals of Jorge Socarras, founder and frontman of early ‘80s NYC art rock band Indoor Life as well as a close collaborator of electronic pioneer Patrick Cowley. “It was total magic in the studio to share a mic with him. He said he was a one-take kinda guy and he was” Benzvi recalls. On the track Socarras and Benzvi call and respond to each other with a sweet and robotic dissonance atop raging, droning beats. After recording, the band spent a week with producer Jonathan Schenke (Parquet Courts, The Drums), who did some final mixing, leaving them with a record that’s assured, inventive and unabashedly fun. Amidst a grim and staggering cultural political zeitgeist, Data acknowledges the trivialities of human existence with self-aware humor through dissociation and escapism. “It’s about adding an element of discovery to these things that are very mundane and routine for us,” Benzvi adds. It’s apt; mundane themes like relationships woes can seem miniscule in the grand scheme of current affairs, but by implementing the childlike wonder of a completely (and literally) alien third party analyzing them, the narrative becomes compelling and, in Strange Names case, a means by which to thoughtfully and infectiously encapsulate the absurdity and nuance of our reality in 2018 through music.